f.26a' Melemundee. May 6th, 1842' (Mehla Maunda near Kandahar). bl.uk > Online Gallery Home	> Online exhibitions	> Asia, Pacific and Africa Collections	> f.26a' Melemundee. 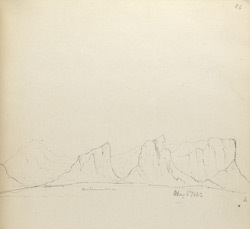 May 6th, 1842' (Mehla Maunda near Kandahar). Pencil drawing of Mehl Manda by George Boyd (1800-1850), dated 6th May 1842. This is one of 95 drawings (90 folios), chiefly of landscapes and monuments in the Deccan, West India and Afghanistan made between 1821 and 1844. Boyd served in the Bombay Infantry from 1820 to 1850 and was mainly employed in survey work. From 1822 to 1831 he was in the Deccan and Satara; in 1835 he was on survey in Kathiawar; and in 1839 he was making road surveys in Sind. He was mentioned in dispatches during the war in Afghanistan in 1840 and in 1842 he worked on a survey between Quetta and Kalat. The River Mel Manda runs through the Mel, a valley around 15 miles long and 5 miles broad, on the route from Chaman to Kandahar in Afghanistan. The villages in this area comprise 'kizhdis' or booths which are often covered with long, coarse, black blankets or wattle mats made of tamarisk twigs and lightly thatched over with long coarse reeds called 'nal'. Each village consists of between ten and twenty booths. The people of the valley are known as 'kakozai' and move in summer to the Samai Mountains to graze their flocks and escape the heat. The Mel Manda rises in the Hadah hills and flows in a south westerly direction until it joins the Dori river.